I was experimenting with EyeEm in December, which is when I took this picture of the Freedom Tower. My husband and I spent our five year anniversary in Manhattan this past December. My parents watched our daughter for three nights, which meant we went to shows, explored different neighborhoods by hopping on and off the subway, and enjoyed relaxing dinners. We also had the chance to do something we wanted to do for awhile: visit the 9/11 Memorial. We bundled ourselves up the day before our anniversary and headed to Lower Manhattan. We stood in long lines and went through security. Finally, we arrived at the National September 11th Memorial. We read the names of those who perished on the bronze panels as we walked around the perimeter of the Memorial’s twin reflecting pools. So many names. So much loss. We also looked around Memorial Plaza. I was amazed when I looked up. Work continued on the Freedom Tower — on a Saturday afternoon. Watching construction continue on a weekend moved me. Many New Yorkers, including me, objected to the construction of the Freedom Tower (aka: One World Trade Center) for a variety of reasons. However, after visiting the 9/11 Memorial, my opinion of it changed. The building represents so much. Resolve. Comeback. Hope. I visited my family in the New York Metropolitan Area this past weekend. I caught a glimpse of the Freedom Tower as we drove over the Brooklyn Bridge back to Manhattan. Though the skyline is very different from the one I grew up with, there was something comforting about seeing a skyscraper rise up from Lower Manhattan again. We took a detour to Shanksville on our way out to Pittsburgh this past May since I wanted to visit the Flight 93 National Memorial. I’ve felt deeply indebted to the men and women who staved off an attack on the U.S. Capitol ever since reports surfaced about their bravery on September 11th. My husband and I held our daughter’s hand as we walked through what used to be an ordinary field. While not all of the features of this memorial are complete, my chest felt heavy by the pieces of it that were. A timeline of the day. An explanation of what happened on-board the flight. Photos of the passengers and crew members. 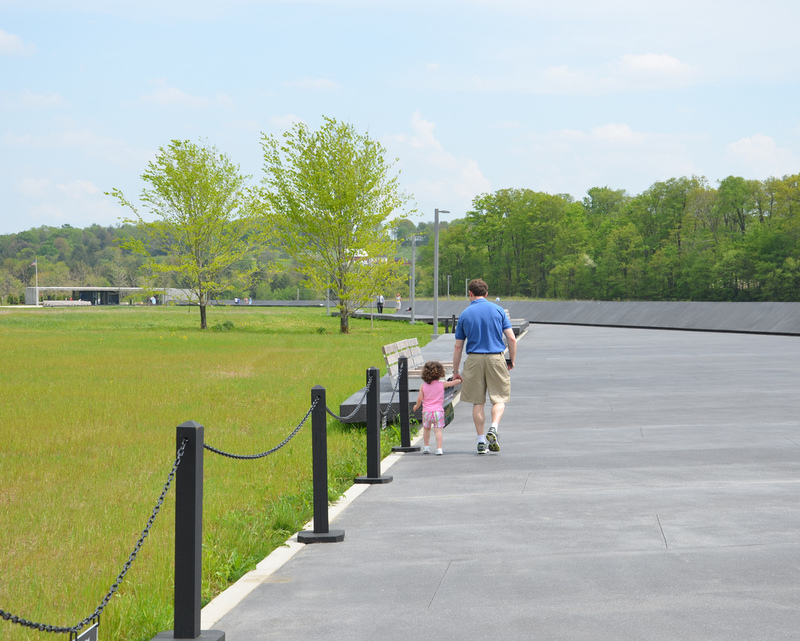 We held hands and walked through the Memorial Plaza Wall and Walkway, which is a long black wall that marks one of the edges of the crash site and the debris field. It was hard to believe a plane went down in what seemed like such a tranquil spot. I squeezed my daughter’s hand a little tighter as we walked together as a family, knowing how many families were broken apart that September day. My husband and daughter walking back towards the Visitor Shelter. One thing I haven’t been able to let go of is something I saw and read in the Visitor Shelter. On the day we visited, it was the birthday of Donald F. Greene, one of the men who died on Flight 93. His photo and bio hung on the Visitor Shelter wall to pay tribute to him. The photo was yet another reminder of a family who was missing their loved one a bit more that day. I went to college in Washington, DC and visit often. However, I haven’t been to the Pentagon Memorial. It is my hope to visit it in the coming year so I can pay tribute to those men and women in the upcoming year. Today I remember all of the victims of the September 11th Terrorist Attacks. What are you doing to pay tribute to those who perished on September 11th, 2001? 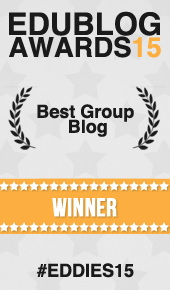 ← It’s Tuesday, so it’s time for the SOLSC. I visit New York often as my niece lives there and each time we go we visit the memorial to see how it’s changed. It definitely took my breath away the first time I saw it and each time after I feel the hope and strength in the people of New York as well as our country! Thanks for sharing your memories! Thank you for this post. There is something therapeutic in memorials and retelling our memories of that day, as can be seen in these equally moving comments on your post. I was in college at Boston University at the time. I woke up to a message from my friend saying that we had been bombed- an initial misreport. I didn’t know what to do; I had class. I started walking to it, and I remember seeing everyone on the sidewalks on their cellphones, clearly worried and upset (so many kids at BU were from NY). At that point, I decided it was best to just stay home and figure out how to wrap my mind around what was happening. My roommates dad worked a few blocks from the WTC and of course she couldn’t get reach him. It was horrible. I continue to be amazed and moved by the heroism of that day and the way the country doesn’t forget. This is beautiful Stacey. Thank you for posting. The emotions are still so raw that surround this day. I really thought hard about how best to approach it with students, and I am aiming to give more airtime to what people have created, not what was destroyed. Your reminder of the importance of family is so valuable. Such a hard day…even all these years later. Thank you for this post, today, and for your reflections about visiting the memorial sites. Those are two powerful reminders of what was lost that day…and how we changed as a nation forever. Sorry to keep posting, but I found the link for the brief speech written by Maria last year for the morning announcements at her school. I remember that, Ramona. Thanks for drawing our attention to Maria’s writing again. I think it was last year that someone in our SOL community shared a speech she had written for her school about 9/11. I thought I had saved it, but have been unable to find it this morning. Did anyone out there bookmark it? Each year I use the book 14 Cows for America by Carmen Agra Deedy to have a discussion in my middle school classroom about this difficult subject. It’s a book that belongs in every teacher’s library. I, too, was teaching a group of third graders on our 5th day of school. It was such a beautiful day. We didn’t tell them either. We worried about parents who were traveling and kids who would be both scared and disturbed by all of it. Trying to stay calm I raced to my computer and emailed my mother, my sister and a friend asking them to give me news. I was not used to getting my news online back then but I found msnbc and cried silent tears at what I saw. It was so frightening to me. My sister was in Manhattan and managed to get home to Long Island, my brother-in-law, too, to Westchester. A day later I found out that one of my former students watched the scene from his bathroom window very close to the WTC area, then walked blocks and blocks uptown when told to evacuate and then came here. They were all safe. Then the enormity of the loss and the heroism began to sift in. Soon we found out that our small upstate town lost three people, one of whom I knew, in the WTC. All of it horrible. All of it. You have inspired me, Stacy, to go to the memorials. I have been to Manhattan since, but not there. What I worry about is what is next. I so want to hope. So much has changed in this world. Thank goodness for strong, courageous people and caring teachers, too. It was an amazing morning that September 11th, sunny and cool. It was early in the school year and we were just starting to get to know each other. In that first class that began at 7:30, a young boy sat near the window and as we left the room when the passing bell rang life changed for all of us in the next half hour, but for that boy, the nightmare began for him, his young sister and his mom. I think of them on this day. I’m so glad that Ray, Samantha and I connect on Facebook. Thank you for your very personal memories. All of us will remember where we were when we heard about the tragedy. I was teaching, of course, and we did not tell our students. They were 3rd graders and we felt it best for parents to talk to them about it. So the day was filled with silent worry and concerned teary eyes between adults. The day haunts me still and I do not really know the words to say to my young students.